What is the T3 Foundation? Welcome to the T3 Foundation. The T3 Foundation was established in early 2016, a non-profit organisation established to improve the health and well being of our elderly, in particular those who live with Alzheimer’s and dementia. The nature of T3 Ping Pong means that even those in the further stages can benefit on a social, mental and physical level. T3 Foundation provide free or subsidised sessions, classes, events and equipment within London and the Greater London area. It’s sociable, with 3 to 4-a-side, so that’s 6 to 8 at the table at one time! You can’t help but join in, chat and laugh. It’s played seated, in an armchair or wheelchair or even standing too if they are able. It’s easy to play, especially with our special lightweight, easy hold bats and larger balls. The T3ONE70 measures only 1.7m in diameter meaning it can fit comfortably in the lounge of any residency. 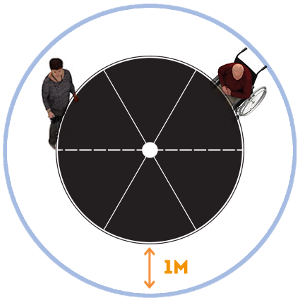 Adding a meter to the diameter allows enough room for those playing seated and also for those able to play standing, this gives you a required playing space of 2.7m x 2.7m. Download our T3 Quick Start Rules to get the games going! If you’d like to help us fight dementia through the magic of ping pong then please come and volunteer with the T3 Foundation! There are lots of ways you can help, from a simple donation, which goes a long way, to volunteering yourself or your company in assisting or even hosting a T3 Ping Pong event yourself. For more information on how you can get involved, please call us on 0203 637 6282 or email enquiries@t3-foundation.org.uk now! To donate or become a corporate sponsor and ‘Friend of the T3 Foundation’ please call or email us to discuss our Staff Charity Programme.